Please join us to celebrate the opening of The Art of MARCH: A Civil Rights Masterpiece at The Society of Illustrators. This new exhibit was co-curated by CBLDF’s Executive Director Charles Brownstein and Kitchen Sink Books Creative Director John Lind. The Art of MARCH is on view through June 30. The Art of MARCH offers viewers a unique opportunity to interact with the National Book Award-winning narrative of Congressman John Lewis as illuminated by Nate Powell. 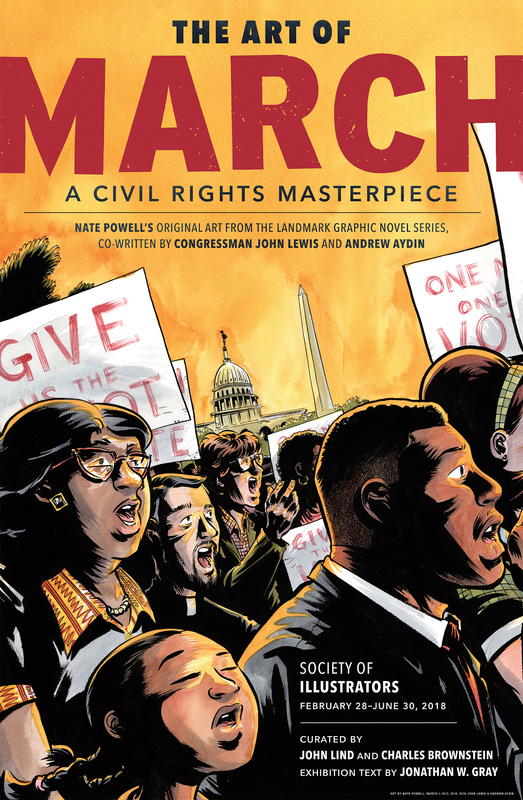 The Art of MARCH: A Civil Rights Masterpiece walks visitors through the story of Congressman John Lewis’s experience in the civil rights movement as depicted by the pen of MARCH trilogy illustrator Nate Powell. This landmark exhibition of Congressman Lewis’s celebrated graphic novel memoir, co-written with Andrew Aydin, takes visitors on a visceral tour of the movement, illuminating pivotal moments, people, and philosophies through the display of over 150 pieces of original art, interactive materials, and new exhibition essays by Dr. Jonathan W. Gray, Associate Professor of English at John Jay College of Criminal Justice and author of Civil Rights in the White Literary Imagination: Innocence by Association (The University Press of Mississippi. 2013). Visitors will glimpse how this comics masterpiece was created, with behind-the-scenes process art and artifacts from the creative process. A portion of the exhibition also shows how Eisner Award-winning Powell matured from an SVA student steeped in the punk zine culture to become the illustrator of the most important political graphic novel of all time. Your support by attending tonight’s opening reception will provide the means necessary to welcome thousands of students to the Society of Illustrators for educational programming related to The Art of MARCH. Through the generous contributions provided at this opening reception, you can help the Society welcome Title I and other schools that would not otherwise be able to access this exhibition. More information on the exhibit and related events can be found at www.societyillustrators.org/exhibits/march. The MARCH trilogy has been recognized for its groundbreaking storytelling with numerous accolades. MARCH: Book One became the first graphic novel to win a Robert F. Kennedy Book Award, MARCH: Book Two won the Eisner Award, MARCH: Book Three is the first graphic novel to receive a National Book Award, and the trilogy has spent a combined 99 weeks on the New York Times Bestseller List. MARCH is published by Top Shelf Productions, an imprint of IDW Publishing. If you haven’t read MARCH yet, you can pick up a copy of the slipcased trilogy, signed by Nate Powell and Andrew Aydin, in the CBLDF Rewards Zone. When in New York, please visit The Art of MARCH at the Society of Illustrators.